When we study that small part of the history of man of which we have records we find that the development of civilization has extended over only a comparatively brief period of time and that it has in the various parts of the earth been parallel and consistent. Thus, though we of the western world may look down upon the civilization of the Far East, perhaps because the East did not produce such efficient battleships, it is evident on closer study that the Chinese are very much like the Westerners. They understood and used bronze at about the same time and, though they have never taken the same interest in iron and steel, it was their invention of the lens and gunpowder which made possible these modern battleships. Not only were there a number of cultures which originated at about the same time, but it must be kept in mind that from 2,000 years ago (at just the time these cultures began to take on marked individual characteristics) travel, inspired by commerce and war, commenced to bind together the races of man with an ever stronger bond. It is therefore not so surprising that at certain given times man"s development in the various parts of the world should be such as to produce simultaneously great artistic achievements. The tremendous wars which the Mongols waged under Jenghis Khan and which influenced the East and West alike may have dammed the flood of production until it rose to the irresistible pressure which found expression in the courts of the Ming Dynasty as well as in those so similar ones of Renaissance Italy. The religious fervour which made Gothic art possible was not dissimilar to that felt in western Asia an China and both were probably the result of the oppressions of war and at the same time reactions against a too materialistic wealth. . . . The Ming Dynasty (A.D. 1368-1644). -- The art of the Ming period is characterized as a whole by a gradual fading out of the interior glow which under Buddhist and Taoist inspiration had suffused the creations of earlier periods. Concentrated in herself, China had no longer any stimulating contact with the world without; and her art became concerned rather with the beauty of material things than with the expression of the interior spirit. At the same time a reverential conservatism prescribed for the painter both subject and manner of treatment. The painters of this period are so numerous that only a few outstanding masters can be mentioned. The first Ming emperor re-established the Academy of Painting, with the aim of emulating the glories of Sung art [A.D. 920-1260]. Gifted painters flocked to his court. Lin Liang painted ink-pictures of eagles, wild geese, flowers, etc., in a style of extraordinary breadth and power. A good example is in the British Museum, which also has a fine Fairy and Phoenix ascribed to Wu Wei, a master who strove to recapture something of the strong brush-work of Wu Tao-tzu. Very typical of early Ming art are the bird and flower pictures of Pien Ching-chao (Pien Wen-chin) and of Lu Chi, in which a certain solidity and a decorative richness of colour combine with powerful drawing in a large design. 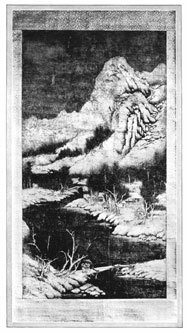 In landscape, Tai Chin, accounted one of the foremost Ming painters, led a new movement and had many followers. His style was broad and free, with little or no colour. Another school preferred minuteness of detail, with an ornamental use of colour, especially a rich blue. Of this school were Chou Ch"en and T"ang Yin, who also excelled in figures. Tung Ch'i-ch'ang (1554-1636), eminent as a critic as well as a painter and calligrapher, despised these "professionals" and their laborious technique. He is associated with the "Learned Man's Painting," in which refined taste and literary associations counted for much more than mere accomplishment. . . . The Southern school, adorned in the earlier part of this period by Shen Chou and Wen Cheng-ming, two much-admired masters, had by the close of the dynasty become triumphant and supreme. Among bird and flower painters of the 16th century, Chou Chih-mien may be mentioned as one of the most distinguished, though his work is rare.